Peridot is a yellowish-green gemstone, though peridot has been known for a very long time, it was in the early days often mistaken for emerald. Peridot ring buyers, today buy the jewel for it's sheer beauty and the bright gemstone. If you had to get a bit more involved in the properties and history of gemstones, your desire and respect for peridot would be truly enhanced. As one of the natural gem options available for a green gemstone, peridot has one unique feature that sets it apart from most other gemstones. While gems like green tourmaline and even emerald are almost always enhanced to improve their beauty, peridot is left in it's original condition and not treated in any way. While most of you would wear a gold or silver peridot ring for it's serene beauty, understanding the gemstone will lift the level of satisfaction that you get from wearing the ring. In the old days, peridot was often called 'chrysolite' and the stone has been known since Biblical times. There is an interesting twist to the reference of 'topaz' in the Bible. After thorough analysis and reference, many gem experts believe that the 'topaz' mentioned in the Bible was infact chrysolite (peridot). This is something of historical significance but, today there is no doubt about the identity and inherent features of peridot gemstones. The gemstone originates from the olivine mineral family and can be seen in just one color tone, green or yellowish-green. A peridot ring would also represent the birthstone for the month of August because, the gem is listed on the birthstone charts as the August birthstone. The color green is closely wrapped to nature, it represents growth, new life and the giving of life. While you might think that, such gem related beliefs and folk lore are not relevant in the modern day, many of you would be wearing a gold or 925 silver peridot gemstone ring because of tradition. An interesting thing about the three prominent green gemstones, green toumaline, emerald and peridot is that - these gems are popular in rings for men and ladies. As you might expect, mens peridot rings would generally have a peridot gemstone that is in the 9-10mm size range. This might be easier said than done, as peridot gems in the 8mm and larger sizes have been showing a rapid rise in price in the past few years. The good news is that, this gemstone shows it's lively green color in sizes that can be as small as 6mm. There was a time when peridot rings for ladies, played up the act on fancy shapes and cuts. While you can still find fancy shapes and cuts in peridot stones, the rising cost of rough peridot has prompted gem manufacturers to stay with the more conventional shapes. The idea is to reduce the stone weight loss, during the shaping and cutting process. Though not much of fancy peridot cuts are released into the markets these days, there is one shape that ladies just cannot get over - the heart shaped peridot gemstone. We do present a stupendous peridot heart ring in the collection listed below. Besides showcasing some of the finest, talent in jewelry design and skilled worksmanship - this peridot gemstone ring with a heart shape peridot, happens to be one of the most meaningful jewels in history. You can get to know more about this spectacular jewel by accessing the full report on the link, provided with the ring below. Kaisilver Peridot Rings: The gorgeous peridot rings shown on this web page, are designed and crafted by some of the finest jewelry professionals. Since each peridot ring is fully custom made, you can choose the design, size and metal for your ring. We provide quality gems, design and worksmanship for both gold and 925 silver jewelry. You could choose any ring from our website and request for it to be made with a peridot gemstone. You can also send us your own design images or sketches and let us custom make the jewel for you. Do contact our support experts at sales@kaisilver.com for any requirements or queries that you might have. A mens peridot ring that packs in stunning looks and impressive durability. 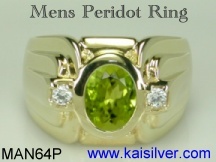 The MAN64P peridot diamond ring for men is available in gold or sterling silver. A well researched design and substantial metal weight, help enhance the toughness of the jewel. The oval peridot gemstone in the center is bezel set with the entire edge of the gem wrapped in metal. While providing an extremely secure setting for the gemstone, the bezel set stone is also well protected from side impact. This ring demonstrates how a fine design combined with a natural and untreated gem, can impress men. For a mens birthstone ring, this peridot gemstone ring represents the month of August. If you prefer to order this ring as a mens peridot gold ring, you can choose a yellow or white gold option. For mens gold rings, we generally recommend 14k white or yellow gold but, also provide an option for 18k gold rings. The majestic dimensions and appearance of this ring, make it suitable for a mens wedding ring too ... more. A unique peridot ring, with tremendous meaning. While the heart shape of this gold or 925 silver peridot ring symbolizes love and affection, the four centuries old claddagh ring concept is widely accepted as the most meaningful jewel in history. A peridot heart ring is not very rare but, finding a heart ring with such meaning and fine craftsmanship is not very easy. You could get this gorgeous peridot heart ring for yourself, or choose it for that very special person in your life. Just keep in mind that the wearing or gifting of a heart shape jewel, need not always imply a matrimonial relationship. You could gift this peridot ring as a mothers ring, the green gemstone would symbolize the love between mother and child - always fresh, always pure no matter how far the geographical distance between them. The claddagh ring concept is being increasingly seen in fine wedding and engagement rings and this, is one other occasion for which you could wear this jewel. 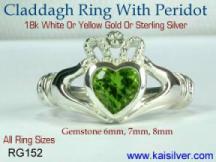 Kaisilver provides fine craftsmanship and custom cut gems for both gold and 925 silver claddagh peridot rings ... more. We are aware that there are many more green gemstones that, could be used for mens rings. We can custom make a mens ring for you with any gemstone of your choice. The design for your mens green gemstone ring could be yours or ours and rest assured that, both gold and 925 silver mens rings will have the same quality of material and worksmanship. Other green gem options for mens rings could include green sapphire (expensive), green tsavorite (expensive), green demantoid (expensive). When it comes to mens green gemstone ring with gems like green apatite, green fluorite and even green chrome diopside - you should know that these gems do not have sufficient toughness that is expected for gems set in mens rings. Kaisilver Rings: We custom make all types of rings and jewelry in gold or 925 sterling silver. You can choose a design from our website and request for design modifications or, send us your design idea in the form of a sketch or image. We handpick and custom cut every gemstone that is used in our jewelry, you are therefore not limited by gem type, size, shape or cut. Do contact our support experts at sales@kaisilver.com for any requirements or queries that you might have. We do not mind if you purchase nothing from us and finally make buy your jewelry from another jeweler, all we want is for you to make a well informed buying decision. Related Resources: Mens Green Gem Rings .